LINCOLN, Neb. — The final week of spring practice has arrived in Lincoln as the Huskers moved one day closer to Saturday’s spring game. However, the Huskers took the field at Memorial Stadium this past Saturday as well and defensive coordinator Bob Diaco had a positive review of what the Huskers were able to accomplish. 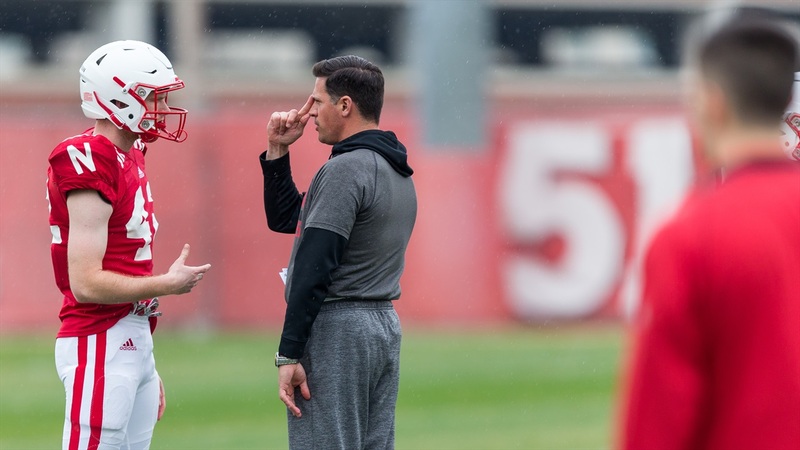 With spring football nearly compete, Diaco said the main area where the Huskers need to make the biggest strides on defense is communication. Diaco said in his defense, the inside linebackers are the ones who need to make the calls for the line of scrimmage while the safeties are in charge of calling out the coverage assignments. Diaco had significant praise for a few players in the back seven for how they have handled the defensive transition to this point. Another player who falls into that category is nose tackle Mick Stoltenberg. At 6-foot-5, the native of Gretna, Nebraska, is a bit taller than the average nose, but Diaco doesn’t see that as a problem. “I think if the player can bend and play with angles, the bigger the better,” Diaco said. The junior-to-be said he has focused on improving his flexibility in order to better perform at his new position. Stoltenberg has embraced this spring after not being able to participate last year because of an injury and said the team has made tremendous strides. Saturday will provide a chance for a number of young Huskers to play in front of the fans as an excess of 70,000 fans are expected to be in attendance.